Wyndsong Cavaliers is a small hobby/exhibitor breeder of beautiful, affectionate Cavalier King Charles Spaniels. Contact the site for more information. The King Charles Spaniel is the largest of the toy dog group. They were the favorites of King Charles and aristocrats in England in the late 1600’s, and roamed freely throughout Blenheim Palace. They were known as “comforters” because they not only were lap dogs, but they also helped to keep their owners warm at night by sleeping with them. 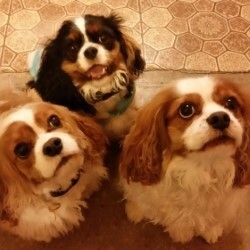 Cavalier King Charles Spaniels are very friendly and are a sporting dog. They love to chase butterflies and birds, and have no nervousness about them. The characteristics that made them popular to the English court make them equally popular today. Cavaliers are excellent with children, older adults, singles, people who are active or inactive. They are affectionate, social, gentle, and love to be outdoors. As they have no fear, they do need to have a secure environment outdoors for their safety.